America's biggest hospital chain, HCA, has agreed to be bought out in a record $33bn (£17.8bn) leveraged deal. Under the deal, a private equity consortium will pay $21bn for the Nashville-based firm, as well as assume around $11.7bn in debts. Investors will receive $51 per share under the deal - a 6.5% premium on its Friday closing price of $47.87. HCA owns and operates 176 hospitals and 92 centres in 21 states across the US as well as in England and Switzerland. The company was founded in the 1960s by the family of Senate majority leader Bill Frist, who recently sold his holding in the company. The buyout group - which includes Bain Capital, KKR and Merrill Lynch - is being advised by Merrill, Bank of America, Citigroup Global Markets and JP Morgan. The deal will overtake KKR's 1988 purchase of tobacco and food giant RJR Nabisco. Under that deal KKR paid $25.07bn for Nabisco and took on $6bn in debt. News of the deal came as HCA revealed second quarter profits had fallen to $295m from $405m a year earlier. Hospital groups are struggling to boost their earnings in the face of an increase in unpaid hospital bills, driven by the 46 million people not covered by health insurance in the US. 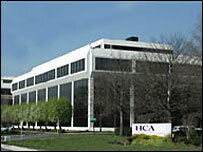 HCA is the largest private hospital chain in the US.